High performance and cultural relevance meet in concrete, metal, and steel mesh envelope. For the stakeholders involved in building the new Rev. Avery C. Alexander Academic Research Hospital (also known as University Medical Center, or UMC) in downtown New Orleans, the project was about much more than replacing facilities damaged during Hurricane Katrina. “The grander story is the effort to rebuild New Orleans,” recalled NBBJ principal Jose Sama. “There was a lot of emotional attachment to the original hospital, Charity Hospital, and also—rightly so—the pride the community has for the character of the city. Everyone wanted to make sure the project was going to be something that was of New Orleans.” In a joint venture with Blitch Knevel Architects, NBBJ rose to the challenge with a design that subtly reflects the city’s cultural heritage. The building envelope, a combination of precast concrete, metal panels, high performance glazing, and stainless steel mesh, contributed significantly to both the project’s aesthetic aspirations and its performance goals. In fact, most of the damage sustained by Charity Hospital was the result of flooding rather than high winds. 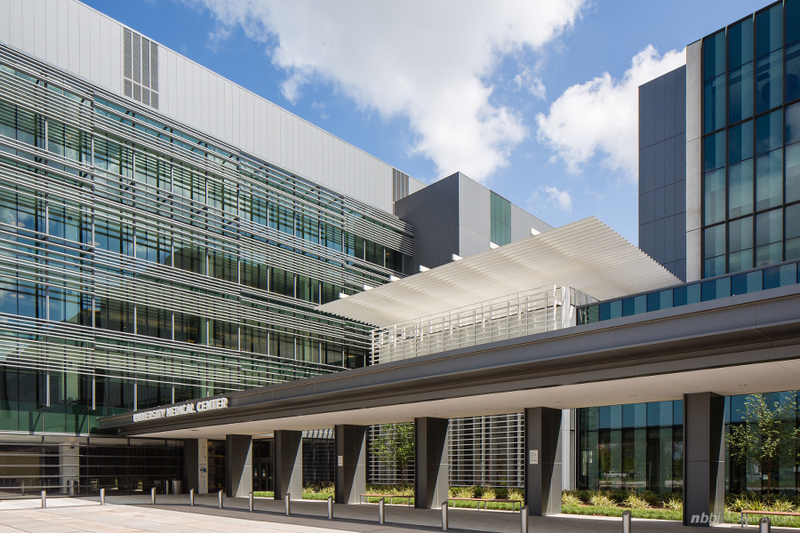 As a result, the architects faced a mandate to elevate all critical hospital functions above 22 feet. “We envisioned this as a floating hospital,” said Sama. “The notion was that the more public zones, the softer spaces like dining, registration, and the lobbies, would occur at the ground level. Then you move up to an elevated plane of critical services. That way they could function regardless of flooding.” The building envelope reflects this programmatic move: The first floor of the central campus structure—the diagnostic and treatment center—is wrapped in a transparent curtain wall with a strong emphasis on the horizontal while the upper, critical floors feature a precast concrete facade. The two other project components, the medical office building and the inpatient towers, offer variations on the theme. The former is clad in an insulated metal panel system, the latter in precast concrete, glass, and stainless steel mesh. 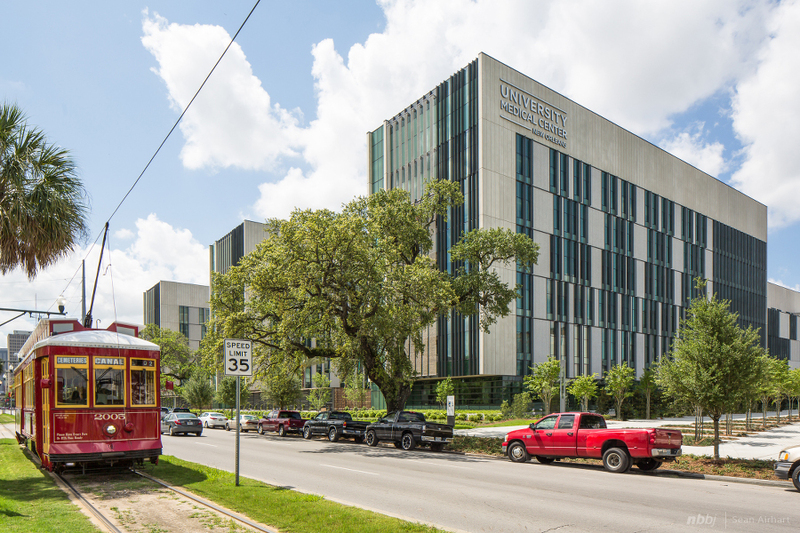 A number of subtle gestures connect the hospital exterior to New Orleans’ history and culture. One thing Sama noticed on his site visits was that “the notion of the garden is important, and the notion of getting outdoors.” With that in mind, the architects created a central entry pavilion “designed such that you have a very pronounced sense of entry created by a porch, or a projecting eave—it almost has the effect of a trellis,” said Sama. They also created informal gardens wherever possible. 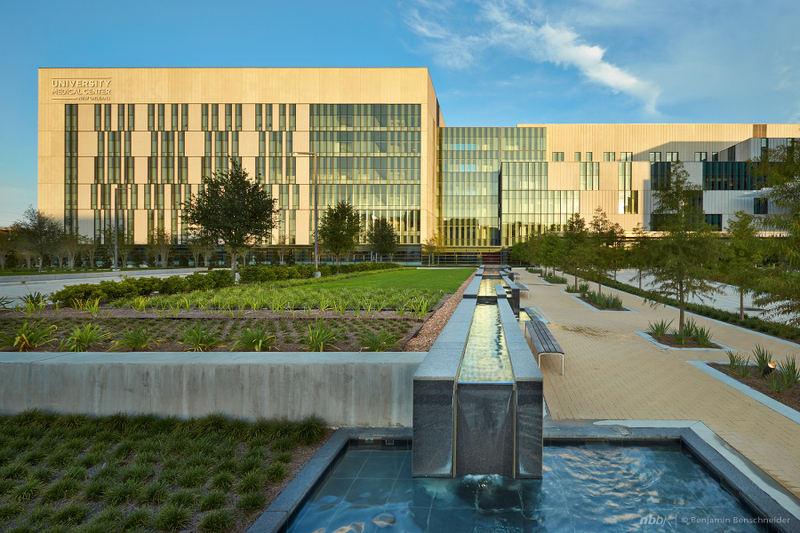 The signature garden, nestled between the towers and the diagnostic center, is water-based, and imagines the seating areas as lily pads floating on a pond. “The idea that here in the middle of New Orleans you find a water-intensive garden was really critical,” said Sama. Cambridge Architectural contributed to several other elements of the project. Mesh fins in the Scale pattern are attached with a custom cable tensioning system to the upper levels of the patient towers, to provide solar shading. 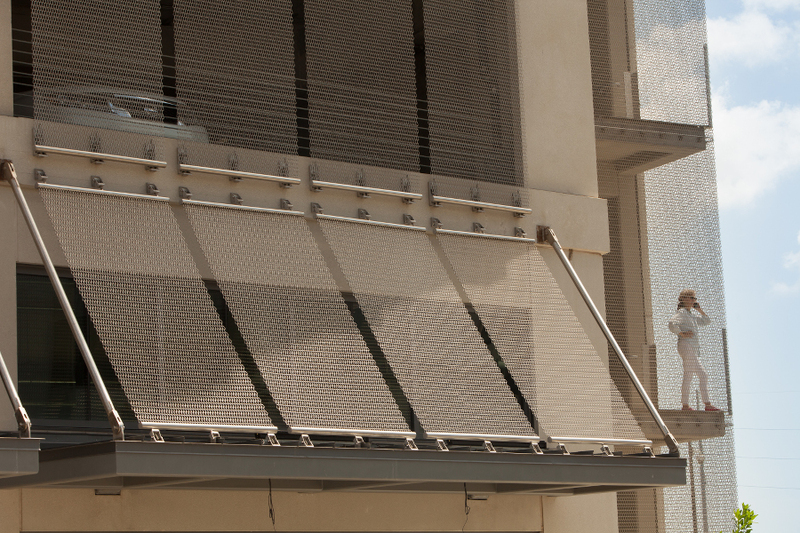 On the parking garage portion, designed by Blitz Knevel Architects, 86 panels of Scale mesh again add both visual impact and fall protection without compromising ventilation. On the south elevation of the garage leading to the UMC helipad, a custom-built shade mesh fin system cuts solar gain and glare.